But by the end of the 1960’s, “Artificial Reality” programs began featuring computer-generated environments that had the ability to respond to the actions of the users in them. In 1987, Jaron Lanier founded the Visual Programming Lab (VPL), which became the first research lab solely dedicated to Virtual Reality. 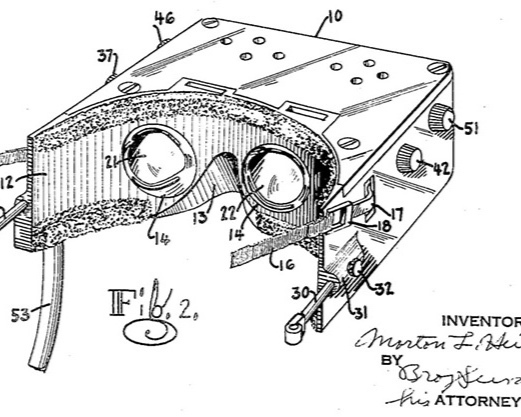 VPL was the first company to sell Virtual Reality goggles and gloves, changing the direction of the field with the introduction of “haptics” which stimulated the senses of touch and motion. The hardware of Nintendo’s “Virtual Boy” delivered monochromatic visuals, uncomfortable ergonomics, and little else. The 90’s were all about Virtual Reality gaming, with the invention of the Cave Automatic Virtual Environment (or simply “CAVE”), which is an immersive virtual space where projectors are directed to the six walls of a room-sized cube. CAVE systems are still in use today, with flat-panel displays becoming more commonly used over projectors. General consumers also had access to Virtual Reality hardware with video game companies SEGA and Nintendo announcing consumer-level Virtual Reality headsets for home use. Both systems were huge flops. The Nintendo hardware was uncomfortable, and its graphics were lackluster. SEGA’s hardware never actually made it past the prototype phase. The failures of these two gaming titans to bring Virtual Reality to the mainstream tarnished the general opinion of Virtual Reality possibilities in the real world. Virtual Reality became a concept associated with fantasy storylines akin to The Matrix, and was not well received as a real-life solution to real-world problems. Oculus Rift Dev Kit 1 represents the first of the “modern” Virtual Reality systems. The 21st century brought even more research and development. Oculus VR was founded in 2012, and the introduction of the powerhouse Oculus Rift changed the perception of Virtual Reality forever. Originally, the Rift was most often hyped as a powerful piece of gaming hardware, selling at a rate of 4-5 kits per minute on the first day of pre-orders, but as more and more developers in other areas outside of the gaming industry got their hands on Developer kits, the resulting software began to branch into more “practical-use” territory. Educators saw the possibilities that Virtual Reality offered, and over a short period of time, Virtual Reality began to “grow up” and offer real-world ROI that no one could have expected. In 2014, Oculus VR was purchased by Facebook for $3 billion, and has spent the last few years developing Facebook VR as well as new controller hardware. Google “Cardboard” viewers offer cheap alternatives to pricy headsets. The rise of smartphones has also enabled a new generation of portable, lightweight, and practical Virtual Reality devices. Companies like Google and Samsung have driven development of consumer-level Virtual Reality, utilizing camera sensors, motion controllers, and user interfaces that were already an industry-standard on those devices. With the release of Google Cardboard in 2014, developers produced a steady stream of consumer-minded Virtual Reality software, and the possibilities of Virtual Reality once again opened like floodgates. Not just for gamers any more… But what CAN it do? As we previously discussed, an all-too-common assumption about the uses of Virtual Reality is that it is best used for gaming, and little else. Indeed, developers have already created enough Virtual Reality games to keep the most avid gamers busy for a lifetime, but the practical applications of Virtual Reality stretch far beyond just entertainment. In fact, thanks to the engineering of some of those same game developers, the ability of Virtual Reality to fully-immerse a user into a virtual environment now allows for practically endless possibilities in the business world. Need to see blueprints come to life in order to secure an investor? Mock it up in Virtual Reality. Need hands-on training for a physically dangerous task like tuning a jet engine or removing a gallbladder? Practice it in a consequence-free virtual setting. Want to sell an item that is too bulky or awkward to physically present to potential clients? Let them see it in context in a virtual environment. The possibilities are only limited by imagination. First-hand training for pest-control technicians. The possibilities of Hands-Free Virtual Reality. The upcoming HTC Vive Focus promises to be a self-contained mobile headset that tracks a user's motion with outward-facing cameras. While Virtual Reality technology is nowhere near perfect, the current hardware has opened the door to possibilities that the developers of the 1960s could barely even dream of. With new hardware such as the Oculus Quest and the HTC Vive Pro Eye entering the marketplace this year, and the HTC Vive Focus on the horizon, developers are still finding new and innovative uses for this powerful tech on a daily basis, from training to sales. Oculus and Vive continue to be the industry leaders in powerful and immersive Virtual Reality hardware, and as they venture into wireless headsets, the real-world application of Virtual Reality software is poised to explode once more. We here at V3 are excited to be a part of this continuing expansion into real-world applications. VisionThree, LLC (a.k.a. V3), is an interactive creative agency headquartered in Indianapolis, IN, USA. Focused on Virtual Reality, Augmented Reality, and Touch interactive, we serve and support clients globally with innovative and immersive experiences. V3 specializes in creating experiences that engage, educate, and entertain. Please learn more at VisionThree.com.